We have too many eggs. Seriously too many eggs. 20 boxes of eggs in the fridge for our use. We are getting between 16 and 22 eggs a day from the chickens, we try and sell as many as possible, but any small eggs, dirty eggs or eggs with shell defects go into our use. We also only keep eggs at the gate for 7 days before bringing them into our use. I like to only sell fresh, decent sized, clean eggs to those who choose to buy from us. The downside is the sheer number of eggs we are getting at the moment. The Derbyshire Redcap young hens should increase their egg size soon and if it ever stops raining the eggs will be cleaner. In the mean time though we have a glut! So what to do with all these eggs. We’ve been having scrambled eggs for lunch and omelettes for dinners but it’s just not cutting it so I asked on facebook for some ideas. The first one was Spinach and soft cheese fritters. There was no recipe and I’ve never made fritters so I winged it. 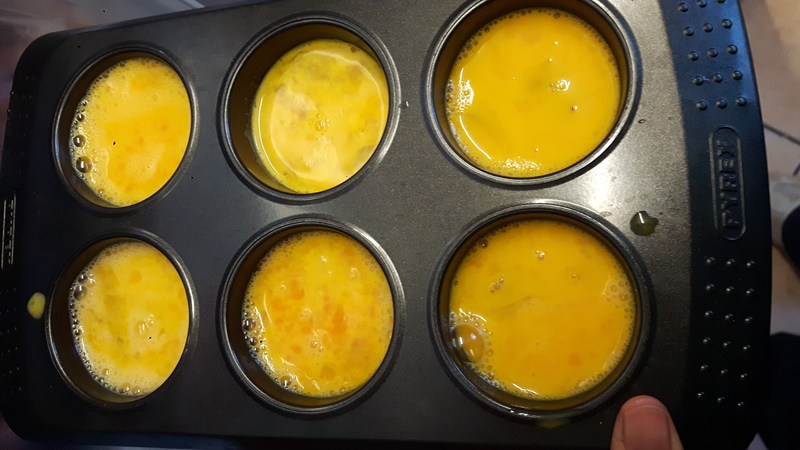 I greased a muffin tray with butter and put a whisked egg into each one. We didn’t have spinach but we did have kale so I chopped that up and put a bunch into each one. I finished it off with a dollop of soft lactofree cheese. Into the oven at 200C for 10 mins. They came out quite well but a bit plain. I think some salt or bacon or even herbs mixed in would help. My second tip would be don’t use butter, a week later I’m still trying to scrub the muffin tray clean, oil may have been better. My next attempt was custard. A few years ago a friend told me custard was easy to make. I love custard but being lactose intolerant I don’t get to have it much. I looked it up but separating eggs seemed far too scary so I left it. I bought an egg separator a few weeks ago and have finally put it to use. I found a really simple recipe online here but as I’m rubbish at following recipes I modified it a bit. My modifications were small, mainly using 3/4 a cup of full fat milk and 1/4 a cup of single cream. I am also terribly impatient and whisking continuously is far too boring so I just turned the heat up to high. I was meant to pour it into a jug once it hit boiling and then whisk until thickened but I honestly couldn’t tell if it was boiling because the whisking was creating bubbles (I may have had some white left in). In the end I whisked until it very suddenly got harder to whisk which turned out to be it thickening. I checked it and it seemed thick enough to now be called custard. I was quite nervous but as soon as I tasted the spoon I knew it was a success, I didn’t even get a photo of the custard in a jug, it was gone far too quickly. It was really tasty but I might do slightly less vanilla in future. I’ll scale it up tomorrow for dessert with Chi as I waited for her to be in bed before attempting this. My last egg adventure is whisking eggs up and freezing them. 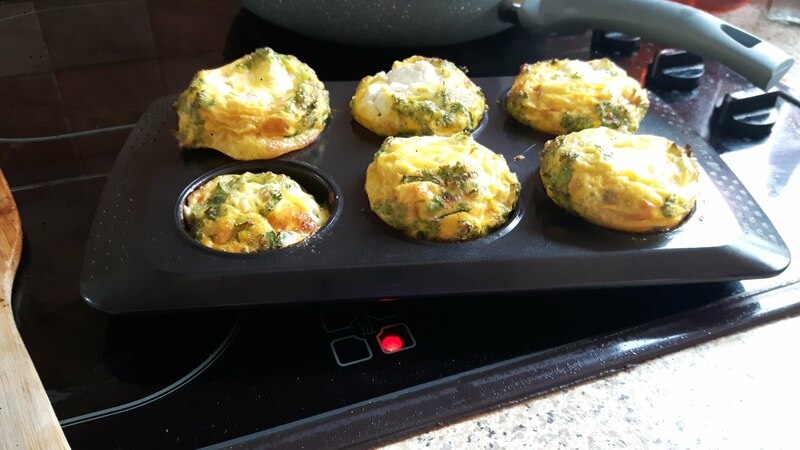 I tried in a muffin tray to start with but I found it very hard to get the frozen egg out. It does work well in silicon fairy cake molds though, popping them out into a bag once frozen. I’ve yet to try defrosting and using them. That is on my to-do list for this week. We’ve been doing all the usual egg dishes as well; egg fried rice, eggy bread (french toast), fried eggs, egg salad, hard-boiled and dippy eggs. Hopefully there’ll be some more posts of ways to use up eggs soon. Quiche and meringue are my next challenges. Do you have a weekly farmers market you could take your extra eggs to, to sell them? We have thought about doing a farmer’s market but we weren’t sure we would have enough produce to make it worth the time and cost yet. 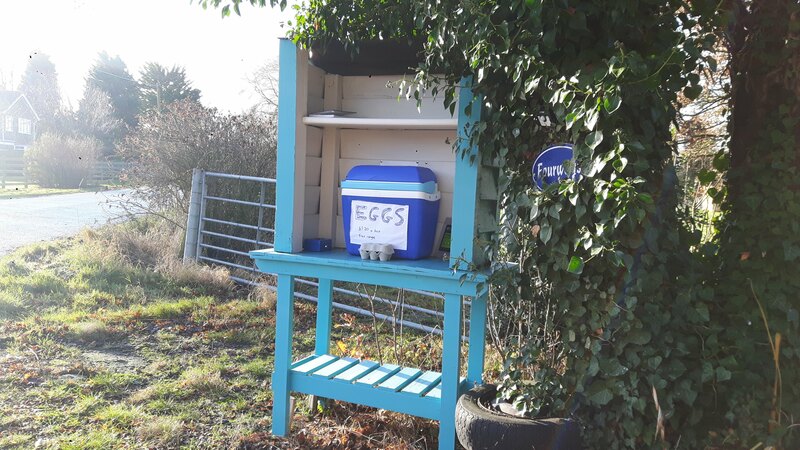 Currently producing about 2 boxes of selling quality eggs a day, which is plenty for the gate, but may not be enough for a stall, especially with no other products to sell. I think there is also the issue of needing to be stamped to sell eggs anywhere but the farm gate in the UK. So we would need to be vaccinating our hens and be in contact with the local egg inspector. As it stands, with no stamp and less than 50 birds we are just in contact with the local food safety officer. It’s something I would like to do in future but as we are currently it seems like too much work for the quantity we produce, and more to take on when we have our hands so full. The big issue we have had is the muddy weather meaning eggs that are too dirty to sell and the Derbyshire Redcaps still being early in their laying so giving us eggs that we consider too small to sell. If I lowered my criteria for selling eggs a bit we would have less coming into our kitchen for us to eat but I really want to make sure that those that buy from us are getting good quality produce. Aye, just need to find people nearby who consume eggs as much as you. Or have you over to help us eat through our supply! Things will start getting better in terms of more eggs going for sale though. 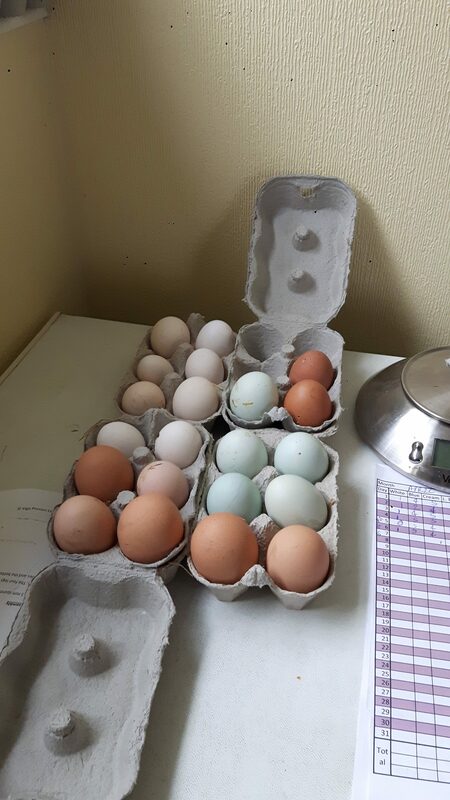 Yesterday we had 15 eggs (renovations on the chicken house so some were put off) but 13 of those went for selling (2 DRC were still a bit too small). Last week we had an 18 egg day where only 3 were clean enough for sale, 15 went into our fridge. The muddy weather really does have an impact on us.